Geoff Duncan, a former Republican member of the Georgia House of Representatives, told Oconee County Republican Party members last month that they should vote for him for lieutenant governor in the party’s primary in May because he will focus on policy over politics. Incumbent Georgia Superintendent of Public Instruction Richard Woods told the 20 at the regular meeting of the local Republican Party that they should vote for him in the party primary next year because of the job he has done during the three years he has held that position. Woods said he ran for state School Superintendent three years ago because “I felt that education had been highjacked...We took common sense out. We took the word child out and replaced it with educational jargon,” he said. Woods said he had changed that orientation. 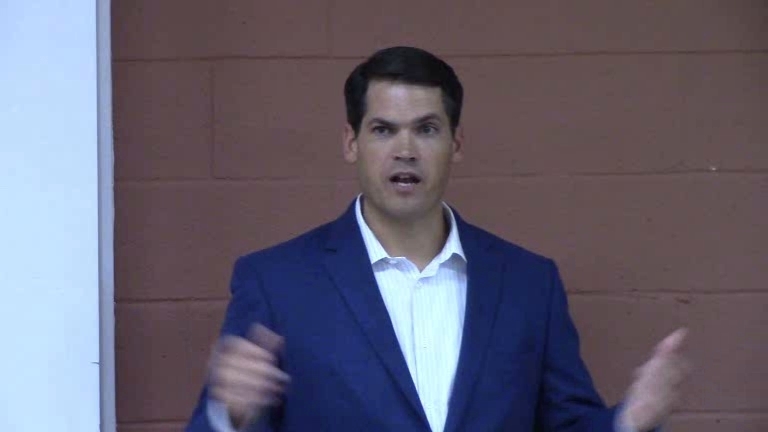 Duncan and Woods were the featured speakers at the local GOP meeting in November, and that part of the meeting was open to the public. Local Chair Tammy Gilland refused to allow any recording of the meeting itself, which, according to the agenda, was to focus on the party’s losses in the special elections held earlier in the month. Duncan, who represented Forsyth County and the 26th District before he resigned in September to run for lieutenant governor, told the Oconee County Republicans he played baseball and football in high school, baseball in college, and six seasons of professional baseball. After leaving professional baseball, Duncan said he and his wife created a marketing company in Forsyth County and then a healthcare company in Atlanta. “We’ve got to stop complaining about everybody else, and we need to start getting involved in our own lives, our own communities,” Duncan said. He said parents need to get involved in their children’s education. He also said people need to stop taking on so much personal debt. “I think we can create a culture that rewards good policy over good politics,” Duncan said. Duncan was particularly critical of State Sen. David Shafer, one of the four declared Republican candidates for lieutenant government. Shafer represents Senate District 48, a suburban district located north of Atlanta and including portions of Fulton County and Gwinnett County. He has been president pro tempore of the Georgia State Senate and executive director of the Georgia Republican Party. Other Republican candidates are State Sen. Rick Jeffares from the 17th Senate District south and east of Atlanta and Rick Knox, running as a conservative anti-establishment candidate from Union County. Following Duncan’s presentation, Pam Hendrix asked Duncan to comment on the loss by the Republican candidates in the special elections for the House District 117 and 119 held on Nov. 7. “We are all kind of licking our wounds here,” Hendrix said. Hendrix wanted to know if it had been necessary to hold a special election. Hendrix said she also was concerned that voters were being asked to vote too often. “It doesn’t feel like that special election process was what the founding fathers intended,” Duncan said in response to Hendrix. Democrat Jonathan Wallace won on Nov. 7 in the 119th House District, made up nearly equally by parts of Oconee and Clarke counties. Democrat Deborah Gonzalez won in the 117th House District, in which only three of Oconee County’s 13 precincts fall. In November of 2016, 30.8 percent of the Clarke County voters in the 119th District cast a ballot for Trump, and 68.5 percent of the Oconee County voters cast a ballot for Trump, making the total district vote 51.1 percent for Trump. Statewide in 2016, Trump also got 51.1 percent of the vote. In all of Oconee County in 2016, 67.4 percent of the voters cast a ballot for Trump. The Oconee County figure compares with the Trump vote of 80.0 percent in Jackson County, 73.2 percent in Barrow County, 76.9 percent in Walton County, 69.5 percent in Morgan County, 62.1 percent in Greene County, 69.5 percent in Oglethorpe County and 28.7 percent in Clarke County. Woods promoted his record during the last three years as state Superintendent of Public Instruction during his presentation. “The most important thing we had to do was allow our teachers to once again build a relationship with our children,” Woods said. “I don’t think we need the Department of Education at the federal level,” he said. He said he was opposed to the “No Child Left Behind” law passed by Congress in 2001 under the George W. Bush administration and against the Common Core initiative in which Georgia and 47 other states joined to a set of core standards for K-12 English language, arts and mathematics. Local GOP Chair Gilland told me in an email message on Nov. 14 that she planned to begin prohibiting video recording of Oconee County GOP business meetings. I responded to Gilland’s email by indicating I believe she has the right to make her request because the GOP meets in private space owned by the Chamber of Commerce rather than in public space. I knew I would not be able to attend the GOP meeting, so I told Bell, who is a member of the Oconee County Republican Party, of the exchange with Gilland. Bell attended the Nov. 16 meeting and produced the video below. She also gave me the count of the number of attendees at the meeting. Bell turned off the video at that point. Duncan began speaking at 1:15 in the video. Hendrix asked her question of Duncan about special elections at 20:57. Woods began speaking at 30:50. 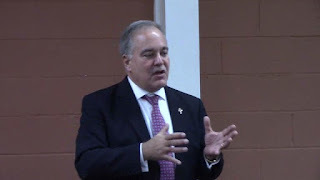 OCO: GOP Meeting 11 16 17 from Lee Becker on Vimeo. Tammy Gilland's request is understandable and legal since it is a private entity, but at the same time, I think the public deserves a more specific statement from Gilland on why she and the Oconee GOP feel that their meetings should not be broadcast unedited to the public. Sarah Bell and Pam Hendrix have expressed pro-transparency opinions, but obviously they do not represent the entire GOP. Mr. Duncan is quite correct that the bills presented to the Congress Critters are either written and passed at the behest of a favored lobbyist or die undeserved deaths because of fear of someone's power. Clear, rational, transparent, and beneficial bills must first be written and presented to the Congress, to be passed or defeated on the merits to the people of Georgia. Mr. Woods is spot on about the interminable testing process of today's education system. Constant testing takes expensive time away from simple teaching by the professionals in the trenches attempting to create better people, more productive citizens, and mature human beings. Business portions of any organization is a private matter for the members of the organization. Broadcast to a blog or print medium is inappropriate.